A-Frame Plant Stand & Tray Set by Gardener's Supply Company at Tulips Orchids. MPN: 39-298**. Hurry! Limited time offer. Offer valid only while supplies last. Running out of room for your houseplants? Use this a-frame stand indoors in winter, then move it outside, plants and all, when the weather warms up. Running out of room for your houseplants? 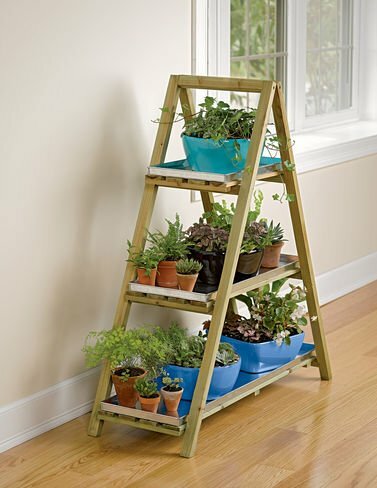 Use this a-frame stand indoors in winter, then move it outside, plants and all, when the weather warms up. Create a stunning flower display and elevate fragrant and colorful plants so you can enjoy them close-up. Wood is treated with a non-toxic, eco-friendly preservative and the stand folds flat for storage. The galvanized, 1" deep, watertight Galvanized Shelf Trays (sold separately or as a set with the stand) catch water run-off and protect floors.